I've been looking at these king cakes all month at the store and I finally broke down today. Their $1 off coupon was the deal breaker. Plus I thought I would let the kids fight about who finds the baby. That always makes for a good night. Kids fighting - that's always fun! 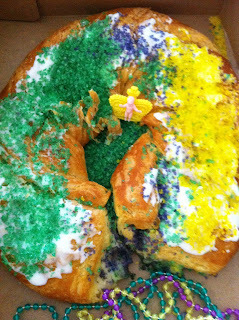 I've never tried a King cake - Hope it's good! I think there's a tradition with finding the baby. Whoever finds it has to buy or make the cake for next year, or something like that. We haven't either but I guess we'll see how it is. Hopefully I can stop myself with one small sliver...we'll have our fill of desserts tomorrow. Not sure about Lent....thought about wine but that would be silly....you? Oh, I might need some help with my header later on. I forget how to do it. Leaving to get the kiddos..call ya later if the kids don't take up too much of my time after school!!!!!! yeah, he who finds the baby buy next year's cake.